Begin by making the white sauce. Cook this mixture on a low heat for two minutes to take the taste of the flour away. Place the carrots into a medium sized saucepan and bring to the boil. Reduce the heat and simmer until just tender. Strain off the water and store until required. Meanwhile pan fry the chicken, onions, mushrooms, leeks and celery and diced garlic on a hot pan for 4-5 minutes. Once the vegetables are cooked add the white sauce together with the blanched carrots and continue to cook over a low heat for a further 10-12 minutes. Stir in the chicken stock, to correct the consistency if you would like a thinner stock. Transfer the entire mixture to an ovenproof casserole dish and allow to cool slightly. Meanwhile to make the topping, mix all the ingredients together. 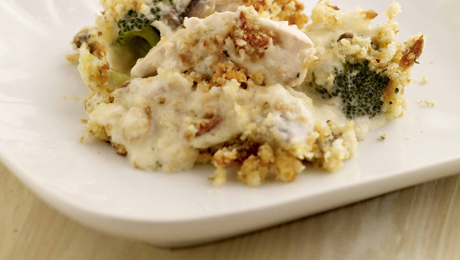 Press this crumble topping mixture on top of the chicken and vegetable mix. This dish is now ready to go to the fridge, the oven or the freezer (See Top Tip). Bake for 30 minutes (longer if coming from the fridge) until the crust is golden brown and the sauce is bubbling. This dish can be frozen once it is well wrapped in the freezer. However it does need to be defrosted, (overnight in the fridge), before baking as per above.